When you buy Happy Parenting: Raising Positive and Empowered Kids you will discover a series of support products within the e-book links. These products include downloadable audio relaxation and visualisation tracks, posters, planning sheets and more! You will receive not only Ivan’s latest information on how to create a family life that is positive and empowered but also the resources to take action steps in your life! 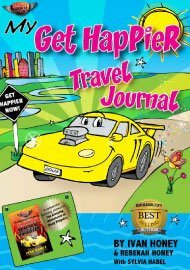 We recommend that families begin by reading the exciting storybook ‘The Amazing Adventures of Doug Dragster’ and using the ‘My Get Happier Travel Journal’ together. This page turning e-book is ideal for parents and children to read together and use the discussion questions as prompts for sharing and connecting. It helps improve literacy and gently teaches the skills for wellbeing and problem solving. A great way for mums, dads and their kids to connect! “It doesn’t matter how clever or gifted you are. If you don’t know the skills for getting happier, it’s like expecting yourself to play a game without knowing the rules. So don’t wait on the sidelines. 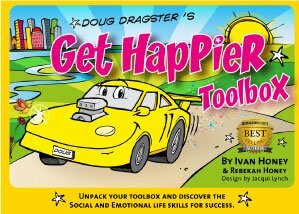 Another perfect resource for families is ‘Doug Dragster’s Get Happier Toolbox’. This fun card set includes games and activities to improve relationships and the wellbeing of all family members. How many times have your children come home with a problem? Maybe a difficult social situation, a problem with a teacher or even just feeling not so good about themselves? Doug Dragster’s Get Happier Toolbox includes a fantastic and simple method for you to help them solve these problems without ‘telling them what to do’! This book is filled with simple tools and tricks to build happy and healthy relationships. It provides a guide to understand each child's needs and how as parents, aunties and family friends. We can choose to facilitate their growth and development (as well as our own). This is a great book that translates decades of experience and practical wisdom - it is accessible and easy to understand. I would recommend this book to everyone. It's pages are filled with opportunities to chose how to approach and build the life that you want. I rated this book 5/5 because it is such an easy read, filled with rich information and practical advice, it inspires positive choices and I have no doubt will help many people. A great, user-friendly, easy-to-read guide for improving family relationships, helping everyone to get along better and meet their needs in responsible ways. A wonderful, more need-satisfying approach to parenting for the 21st century that I will be recommending to all the parents I work with. Ivan Honey you are an amazing person who has changed my children's outlook on life. I use 'The Get Happier Project Resources in the classroom and at home. They continue to grow always having positive happy outlook. Long time wonderful friend and very highly qualified psychologist, lecturer and author of some wonderful kids books, Ivan Honey has released a new E-Book about parenting. Do you feel like you could do with a little inspiration about your parenting? Check out Ivan's book! Ivan says "I truly feel that this book reflects the simplest and most real approach I have found to helping parents live an inspired and purposeful life and help their children. 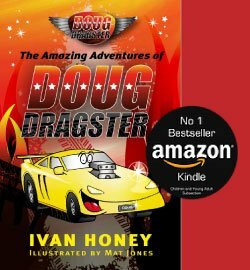 The Get Happier Project books by Ivan Honey are sensational (including 'The Amazing Adventuers of Doug Dragster' storybook). Children of all ages including early years just love it! The resources are particularly useful for anxiety......and well, for life really! Ivan and Bek you are going to touch the lives of families around the world with this book. It's a must have for all parents! I look forward to sharing the wisdom from your book with my children. Well done Ivan!